Zurzeit ist diese Übersicht nur in Englisch verfügbar. Below is the list of SEI CERT rules and recommendations supported as of RuleChecker 17.10. Light-colored items are additionally supported when using RuleChecker in conjunction with Astrée. Exclamation marks denote recom­men­da­tions that, by definition, cannot be checked for automatically by any tool. Further details are available via RuleChecker’s “Help” menu or by contacting info@absint.com. An der C++-Unterstützung wird gearbeitet. Die neueste RuleChecker-Version unterstützt bereit mehr als 100 MISRA-C++:2008-Regeln. Below is the list of supported CWE rules as of RuleChecker 17.10. This includes items with the CWE CCR accuracies Exact and CWE-more-abstract. 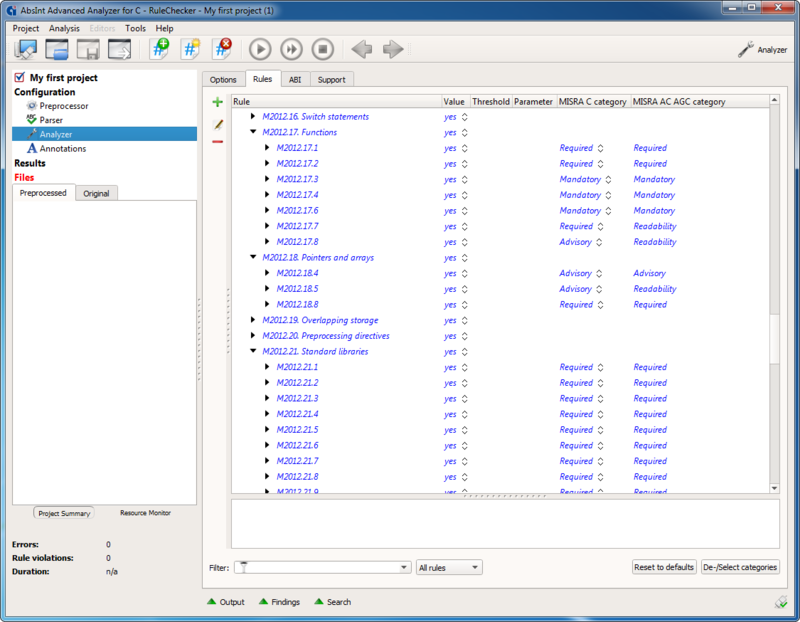 Below is the list of ISO/IEC rules and diagnostics supported as of RuleChecker 17.10. Further details are available via RuleChecker’s “Help” menu or by contacting info@absint.com.